Click Here to complete the 2018-19 Teamwork Sports Membership Team Fee Registration. Please select the full year Fall/Winter/Spring option and use promo code "TSKC25" to receive 25% off the reduced Spring Only Membership Team Fee. This is only valid for the 14u Thunder Hierholzer. Please do not share with other teams. Please see the uniform requirements for the season listed below. TS game cap will be provided to each player at the start of the 2019 Spring season. TS practice shirts will be provided to each player at the start of the 2019 Spring season. Thunder button-up jersey will be provided to each player and must be returned to Teamwork Sports at the end of the season. Each player must have a Navy Thunder Dri-Fit T-Jersey. This can be purchased from Teamwork Sports ala-carte or as part of the uniform package. Each player must have gray game pants w/ navy/red piping. These can be purchased from Teamwork Sports ala-carte or as part of the uniform package. 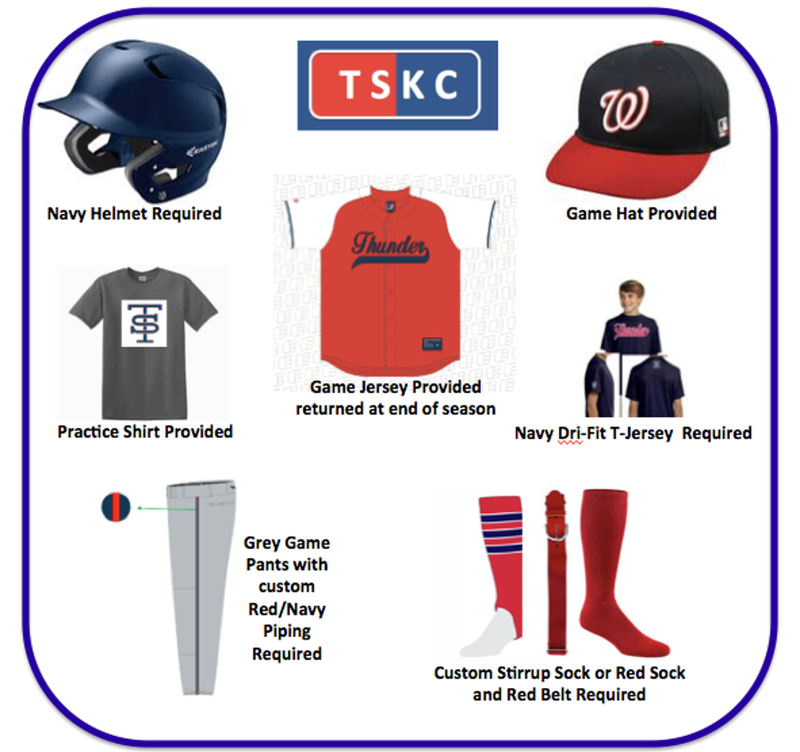 Each player must have custom stirrup socks or red game socks and a red belt. These can be purchased from Teamwork Sports ala-carte or as part of the uniform package. $480 $240 Individual Membership & Team Fee (August 1 - July 31) using promo code "TSKC50" for 14u Thunder only.